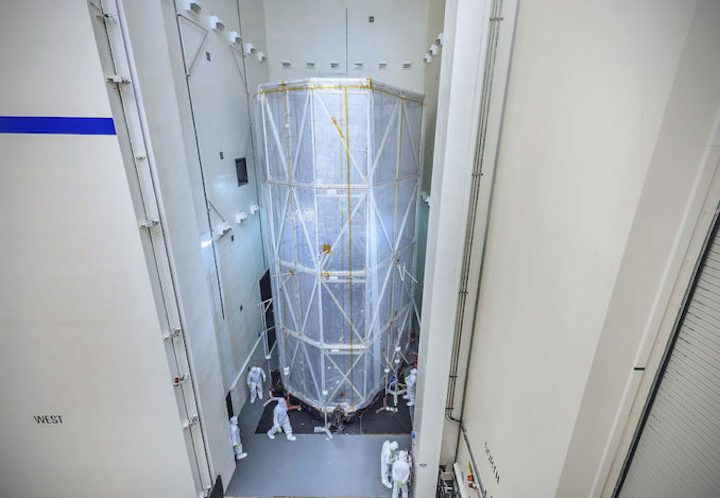 WASHINGTON — As an independent review of NASA’s James Webb Space Telescope continues, the project is dealing with a new problem discovered in recent testing of the spacecraft. “Right now we believe that all of this hardware — we’re talking screws and washers here — come from the sunshield cover,” he said. “We’re looking at what this really means and what is the recovery plan.” The problem, he said, was only a couple of days old, and he had few additional details about the problem. “It’s not terrible news, but it’s not good news, either,” he said. 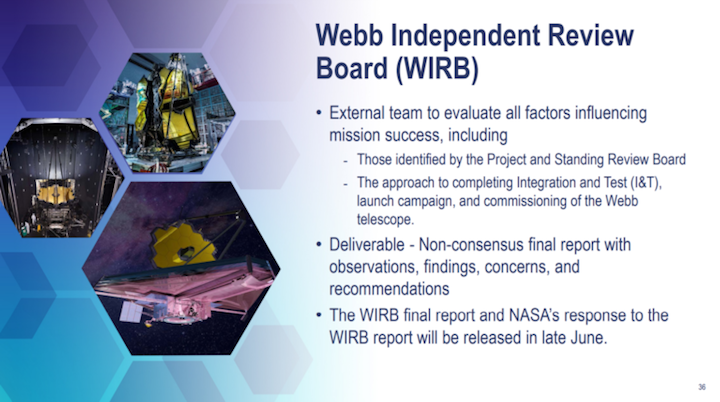 This latest incident comes as an independent review board, chartered by NASA in late March after announcing a one-year delay in JWST’s launch because of other technical issues, is in the midst of its analysis of the mission and its launch readiness. That review, led by retired aerospace executive and former NASA Goddard director Tom Young, is scheduled to be completed at the end of the month. 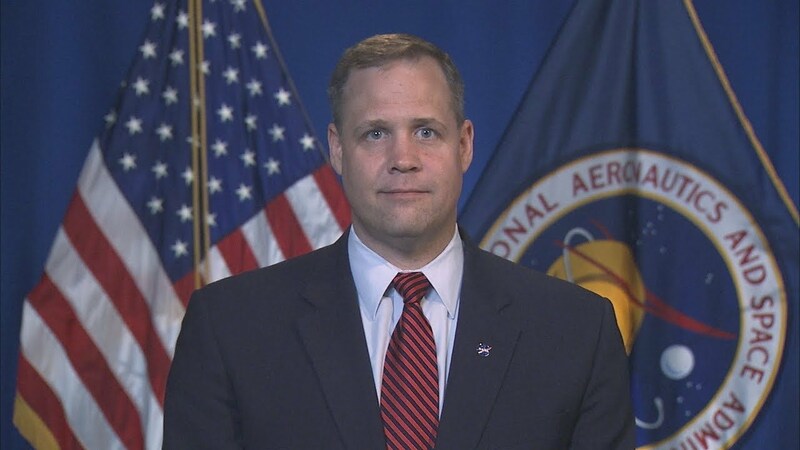 “It was a no-brainer to put an independent review board in place,” Thomas Zurbuchen, NASA associate administrator for science, said at the Space Studies Board meeting May 2. The board, he said, will provide an independent look at the status of the mission and identify what needs to be done to ensure the mission will be successful. Zurbuchen said there would be a “little bit of a pause” after the board delivers its final report, in part because of a prior commitment by Young in early June that makes him unavailable for discussions about the report or additional work. He said NASA will start briefing Congress and others about the report, and the agency’s response, in late June. 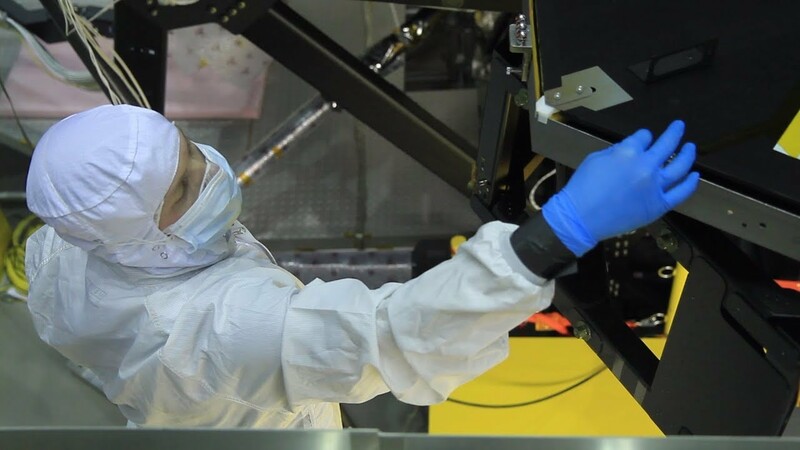 Engineers working on the James Webb Space Telescope, which had its launch delayed to 2020 earlier this year, recently discovered another problem during testing at the observatory’s prime contractor Northrop Grumman in Southern California. 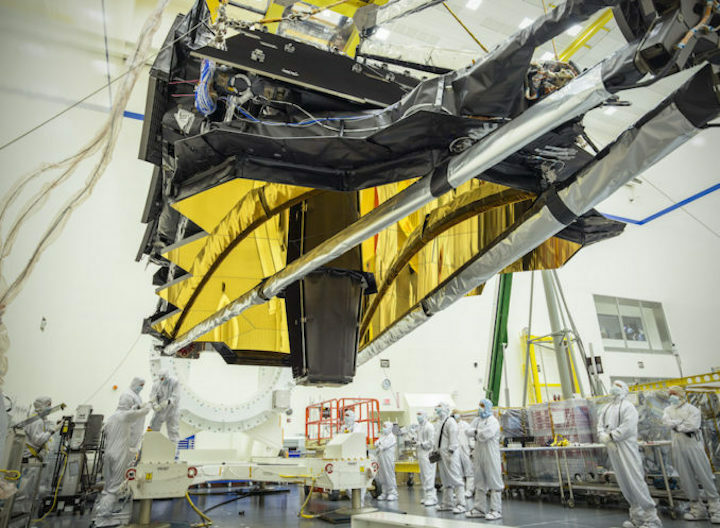 Teams at Northrop Grumman inspecting JWST’s spacecraft element after an acoustic test found fastening hardware had come loose, according to a NASA statement issued Friday. The spacecraft module, which will be mated to the observatory’s telescope section before launch, includes propulsion and power systems, plus a five-layer sunshield to keep the observatory’s telescope in shadow while in space. NASA said in a statement Friday that the loose hardware discovered after the acoustic test was designed to fasten the sunshield’s membrane covers in place during launch. In a statement, Robinson stressed the importance of ground testing to catch such problems. “This is an example of why space systems are thoroughly and rigorously tested on the ground to uncover imperfections and fix them prior to launch,” Robinson said. First reported by Space News, the discovery of the loose fasteners comes after NASA decided in late March to delay JWST’s launch from no earlier than March 2019 until around May 2020, and a prior schedule slip announced last year that pushed back the launch from October 2018 to 2019. “It’s not terrible news, but it’s not good news, either,” Robinson said last week in a meeting of the National Academies’ Space Studies Board, according to Space News. 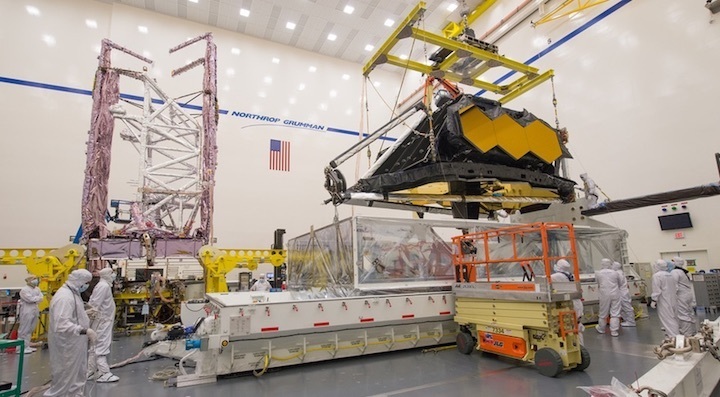 When NASA announced the latest JWST launch delay March 27, officials described multiple concerns with the observatory’s spacecraft element, which was built by Northrop Grumman and is now undergoing environmental testing to ensure it can withstand the rigors of spaceflight. Before the acoustic test, engineers put the spacecraft through a mechanical shock test to simulate the loads it will encounter when the observatory separates from its Ariane 5 launcher. The acoustic test subjected the spacecraft to the intense sound of a launch, while the vibration test — up next in the spacecraft test campaign — will simulate the shaking of a rocket ride. Named for the NASA administrator who led the agency in the 1960s, the James Webb Space Telescope has already cost NASA $7.3 billion. With the launch delay to 2020, the cost to develop the mission could rise above an $8 billion limit set by lawmakers to cover Webb’s development. If that happens, the mission must be reviewed and reauthorized by Congress. The rest of the funding covers launch costs borne by the European Space Agency for Webb’s ride into space on an Ariane 5 rocket, plus operating expenses after launch. NASA officials identified several problems attributed to mistakes by the Northrop Grumman team: a damaged transducer that was incorrectly powered during testing, requiring replacement, valves in the spacecraft’s propulsion system that had to be replaced after they were improperly cleaned, and a catalyst bed heater that was overstressed at the wrong voltage. Engineers also found tears in the sunshield membranes during a deployment test to check how the thermal barrier will unfold to the size of a tennis court once in space, and it took longer than expected to deploy, fold and stow the sunshield. 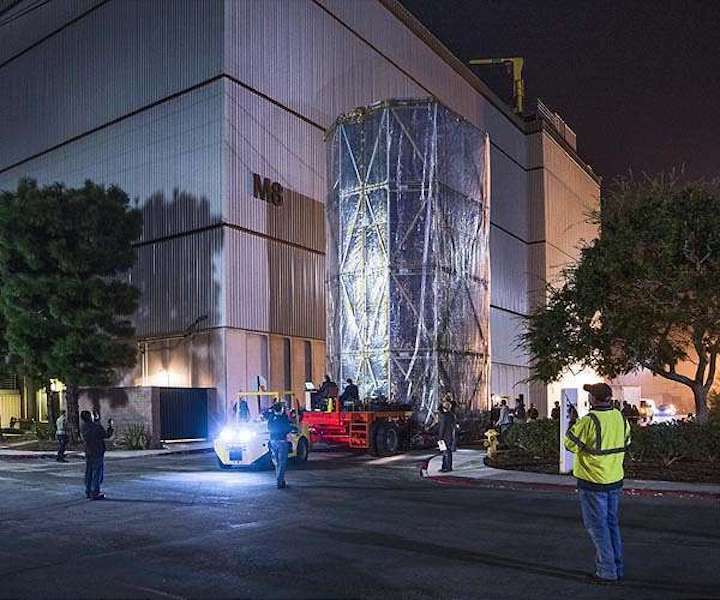 Workers at Northrop Grumman will connect Webb’s spacecraft and telescope elements for combined testing before shipping the observatory to its launch base in French Guiana. 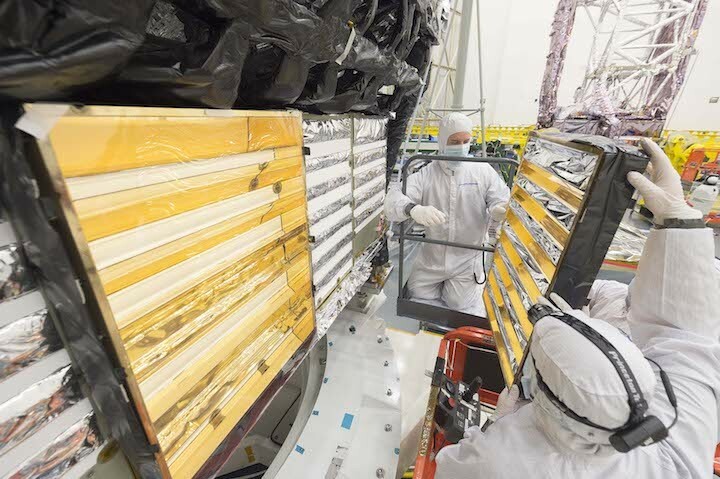 JWST will launch with its sunshield, solar panels, antenna and telescope mirrors folded up for launch, then will go through a weeks-long process to deploy the parts on the way to its observing station at the L2 Lagrange point nearly a million miles (1.5 million kilometers) from Earth. The telescope has completed its standalone testing at NASA’s Goddard Space Flight Center in Greenbelt, Maryland, and at the Johnson Space Center in Houston. It was delivered to Northrop Grumman’s Redondo Beach facility earlier this year. NASA said in March it would install more oversight over JWST in the future, including direct interaction with Northrop Grumman’s president and chief operating officer. NASA also planned to dispatch a project manager to Northrop Grumman’s factory in Southern California on a permanent basis, along with additional NASA spacecraft integration and test experts during critical operations. NASA also added daily and weekly schedule reviews with Northrop Grumman, which will also revamp its management structure. Northrop Grumman is also making personnel changes and updating procedures, officials said in March. Some of the mistakes described in March were caused by poorly written procedures, NASA officials said. 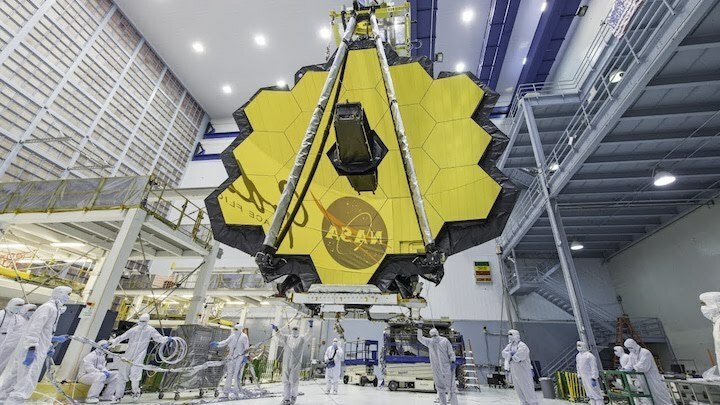 Kathy Warden, Northrop Grumman’s president chief operating officer, said in an April 25 conference call with investment analysts that JWST is a “first-of-a-kind” mission and marks a “huge technological leap” in spacecraft development. “When people are doing things for the first time ever, there is learning that happens,” Warden said. “So we are ensuring that all of the training that we’re giving our people continues to be a focus, so that we can give them the best chance of success. “Doing something for the first time does come with inherent risks, and we and NASA are partnering to identify that and successfully mitigate it, so that we can get this successfully launched and able to fulfill this space exploration mission that we all want to see be successful,” Warden said. An independent review board chaired by Thomas Young, a space industry veteran who served as an executive at Lockheed Martin and as mission director of NASA’s Viking Mars landers, will complete a report examining JWST’s technical, schedule and budget issues around the end of May. The review will help NASA confirm a new launch date, now expected around May 2020, and a new cost estimate for the mission. How will NASA’s James Webb Space Telescope shed the heat generated by its science instruments and their supporting electronics? To anyone who is not an engineer or scientist, the answer might be complex and “baffling,” and it turns out the process is exactly that. 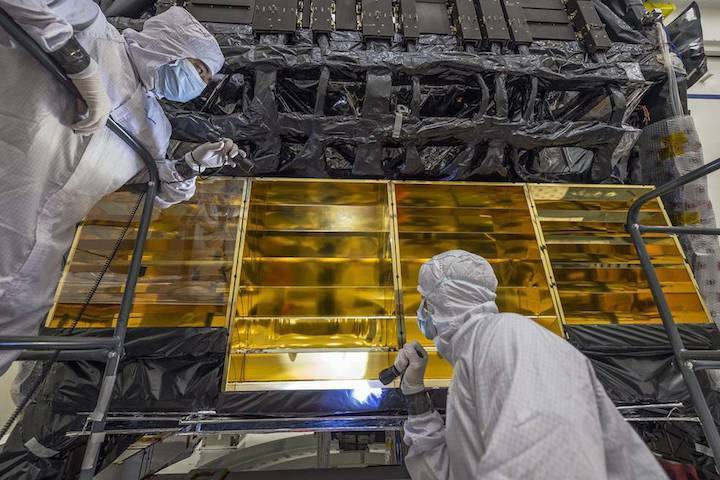 Engineers reinstall one of the gold-plated baffles that helps direct heat away from the integrated science instrument module (ISIM) of NASA’s James Webb Space Telescope. The baffles direct the heat generated by the instrument electronics safely into space and away from any cold areas of the infrared telescope. Webb’s four science instruments are held within a support structure called the integrated science instrument module (ISIM), located behind the telescope’s primary mirror. The ISIM and Webb’s optics form the science payload of the observatory. To keep heat away from the sensitive instruments, a majority of the electronics used to power and operate the instruments are housed in a compartment below ISIM, where specially designed baffles direct the heat safely into space and away from any cold surfaces of the observatory. The baffles essentially act as mirrors to reflect the heat (infrared radiation) outward in a specific direction. If that sounds familiar, it is because Webb’s mirrors will do very much the same thing — but instead of reflecting the infrared light into space, they will guide it with pinpoint accuracy to the telescope’s science instruments. The engineers in this photo are reinstalling the baffles, which had been previously removed and safely stored in a clean environment to protect them from any contamination during integration and testing of the science payload. The clear plastic sheets placed over the baffles will protect them from any contamination during the remaining integration and testing phases for the observatory. The engineers had to reinstall the baffles before Webb’s science payload and its spacecraft element (the combined spacecraft bus and sunshield) are integrated at Northrop Grumman Aerospace Systems in Redondo Beach, California, where both halves of the observatory currently reside. If the engineers wait until after integration, Webb’s tennis-court-sized sunshield will obstruct the ISIM electronics compartment and make reinstalling the baffles much more difficult. NASA’s James Webb Space Telescope will be the world’s next great space science observatory. Webb will solve mysteries of our solar system, look beyond to distant worlds around other stars, and probe the mysterious structures and origins of our universe and our place in it. Webb is an international project led by NASA with its partners, the European Space Agency (ESA) and the Canadian Space Agency (CSA). 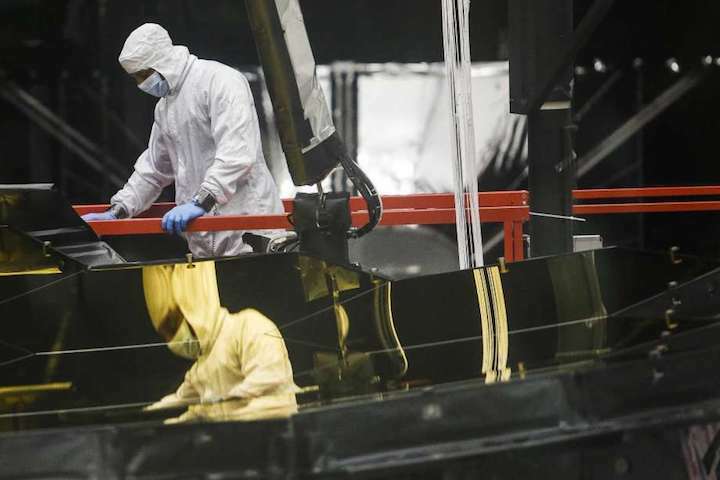 Engineers carefully hold onto a gold-plated baffle as they use a scissor lift to access the back of the integrated science instrument module (ISIM) of NASA’s James Webb Space Telescope. They are in the process of reinstalling the baffles, which direct the heat generated by the instrument electronics safely into space and away from any cold areas of the infrared telescope. Shortly after NASA announced that the James Webb Space Telescope would be delayed another year and cost an extra billion dollars, contractor Northrop Grumman said it has learned from "recent challenges" and will work to keep the project on track. "Northrop Grumman is proud of our many accomplishments on the program, but we recognize that issues we have encountered have impacted the program," spokesman Tim Paynter said in a statement, adding that they have "implemented the necessary corrective actions." The space agency announced Wednesday that the telescope — already more than a decade behind schedule and billions of dollars over budget — would be delayed another year to 2021 and cost almost $9 billion to develop. The announcement followed a review of the project by a 10-member board, which laid out 32 separate recommendations to keep the telescope on track. Those recommendations include proper training of employees, improved risk assessment and creation of a managerial position to oversee system deployments once in space. James Webb, the successor to the Hubble Space Telescope, is meant to revolutionize the world's understanding of planet and star formation. Initially expected to launch in 2007, it has faced repeated delays and burgeoning costs. Wednesday's announced delay pushes development costs past the $8 billion cap set by Congress in 2011, which means Congressional leaders must reauthorize the project in the agency's 2019 fiscal year budget. U.S. Rep. Lamar Smith, R-San Antonio, and chairman of the Science Space and Technology Committee, said Wednesday that his committee will hold a hearing next month to discuss the review board's report. Much of the delays outlined in the review board's report were the result of human errors and other technical issues that can be traced back to Northrop Grumman, which has been prime contractor on the project since 2002. For example, during a test last month the contractor lost numerous screws and washers holding the telescope's sun shield in place. Four fasteners still are missing and it's costing the federal government $1 million per day in delayed work. On Wednesday, Thomas Zurbuchen, associate administrator of NASA's Science Mission Directorate, said the space agency takes responsibility for the problems as well. "Make no mistake, I'm not happy about it," Zurbuchen said. But "we're part of this team that has created the problem we're in." Officials said they believe the March 2021 launch date is feasible if NASA and Northrop Grumman follow the recommendations laid out, many of which the space agency says it has already implemented. Northrop Grumman is "aggressively addressing process and schedule, but we will not sacrifice quality for schedule," Paynter said. "Mission success is our number one priority." In this photo, the big silvery-looking box is the mobile clean room, which project personnel call the "In-Plant Transporter." Nestled inside and visible through the translucent wrapping of the In-Plant Transporter is the Webb flight spacecraft element, which is the assembly of the spacecraft bus and sunshield. Here, the spacecraft element was being moved from the clean room where it was constructed to another building where it will undergo vibration and thermal-vacuum testing.